David Weissman | Raybin & Weissman, P.C. David has devoted his practice to fighting for the rights of the injured and aggrieved, representing individuals in personal injury, social security disability. A battle-tested litigator, he has tried more than 100 cases to verdict. Thanks to his legal prowess, work ethic, organization and passion for his clients, he has established an exceptional track record of success. A native of South Florida, David grew up fishing, boating, playing sports and spending entirely too much time in the sun. He attended Florida State University and graduated from the Florida State University College of Law in 1989. David ran his own firm in South Florida for almost 20 years. During this time, he was instrumental in growing the firm from a two-attorney shop into a firm with two offices, 11 attorneys and a 50-member support staff. 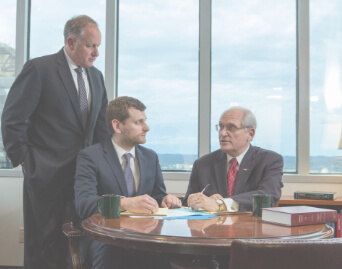 In 2008, David and his family relocated to Tennessee and he was hired by John Hollins, Sr., to run the civil litigation & personal injury practice. David is honored to be a partner at a firm committed to providing clients the best representation available. He firmly believes his clients deserve nothing less. David has become passionate about eliminating texting and driving. As a result, he along with the support of his law firm decided to offer scholarship to the student who did the most to encourage others to stop this deadly practice. Over the course of his career, David has earned accolades that reflect his commitment to excellence. He is AV rated by Martindale Hubble (the highest rating a lawyer can achieve) and has been a longtime member of Best Lawyers in America. Additional accomplishments are listed below.